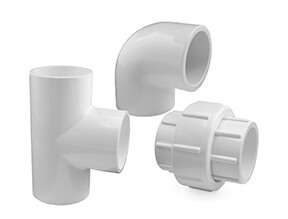 Our white pool pipe and fittings are compatible with all other makes of 1 1/2" (48.3mm outside diameter) and 2"(60.3mm outside diameter) pipe systems commonly found on swimming pools, hot tubs and spas etc. which are supplied and fitted as standard on most makes of pools, spas and hot tubs. Some white pool pipe systems are PVC and some are ABS. These can be connected to each other as long as you use PVC cement. Our white PVC pool pipe has UV stabilisers added to it that stop, or greatly reduce any degradation due to exposure with sunlight. 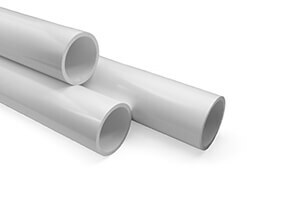 Although 1 1/2" and 2″ are the main white pool pipe sizes found in non-commercial swimming pools, hot tubs and spas, other sizes of pipe and fittings from either our Schedule 40 or any of our standard grey inch ranges are compatible and can be used with them. 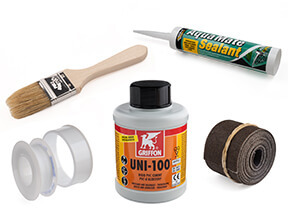 • A ½″ or ¾″ paint brush preferably with a plain, non-painted handle as the PVC cement will melt the paint. • A fine cut wood saw with 8 TPI (Teeth Per Inch) is ideal. A full length or toolbox saw can be used. • A flat file with a medium cut. • Some paper towels for cleaning the white pool pipe and fittings. • Some PTFE tape if you are going to be using any threaded fittings. • A marker pen or chinagraph pencil for marking up your pipe. • Measuring pipe - Measure the length of pipe required, being sure to include the depth that the pipe will go into any sockets on either end. • Cutting pipe - Pipe should be held firmly and cut square. • Chamfering pipe - The cut end of the white pool pipe should be chamfered with a file to an angle of between 22.5 and 45°. This is not to help it into the socket, but to prevent the sharp end of the pipe acting as a knife and scraping away all the cement in the socket as it is pushed in. • Cleaning - Both the pipe and the socket fitting should be wiped with a cloth that has pipe cleaner on it. This removes any oils and other chemicals that may be on the plastic after the moulding process and also ″keys″ the plastic to accept the cement and make a strong joint. DO NOT try to dry assemble the joint after it has been cleaned as the plastic will partially bind together and may not come apart. • Marking - Measure the depth of your socket and mark it on the pool pipe, so that you know the pipe has gone in all the way. • Cementing - Paint cement in the white PVC socket first, that way you can put it down while you then paint the outside of the pool pipe. Be sure the surfaces are fully covered, including the chamfered part on the end of the pipe. •Tidy up - Wipe away any excess cement that has dripped out of the socket and, if possible, leave the socket facing downwards so that any excess wet cement inside the joint will run down the outside of the white pool pipe, and not to the inside of the fitting. This is especially important if you are cementing a pipe to a valve, as you don't want wet glue inside your valve. The table below gives maximum distances between pipe clips or other supports. 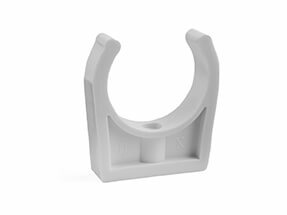 You will need additional supports and clips on your white plastic pool pipe either side of valves and any other heavy fittings or equipment. All white pipes are not created equal! White pool pipe should not be confused with the pipe you will find in DIY stores and plumbers' merchants in the UK. 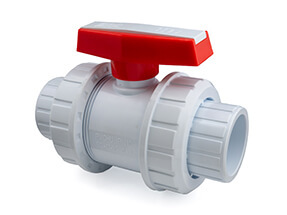 It may look the same but, as well as not being suitable for the pressures you find in pool and spa systems, it is a different size specification and will not fit proper pool fittings. The outside diameter, in mm, of the two main white PVC pool pipe sizes, 1 1/2" and 2″, are shown in the table below. Connecting White PVC Pool Pipe to Pumps, Filters and Other Equipment. The swimming pool, spa and hot tub market is a huge global one and as a result parts are manufactured in many countries to a wide range of specifications. Most pumps, filters and other equipment come with union ends on them allowing 1 ½″ or 2″ white pool pipe to be easily attached to them. Occasionally, however, this is not the case, especially if you are buying second-hand equipment which may come with a threaded connection, or even a flange. The threads on such equipment are very dependent on what market the equipment was originally manufactured for and where it has been imported from. Equipment from North America (or manufactured for that market) will likely have NPT threads, and equipment manufactured for the European market will have BSP threads. To complicate things further, some manufacturers put their own obscure threads on equipment. Plastic threads can be very easily damaged, so it is important that before trying to thread a part in, you are sure it is the right thread. If you are at all unsure, feel free to contact us and we will be happy to advise. 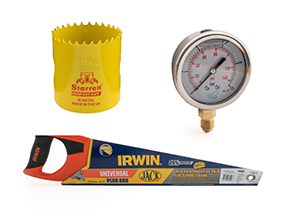 Pre-fitted unions on equipment are often specific to that manufacturer and are designed to seal to the pump or filter with an additional O-ring. 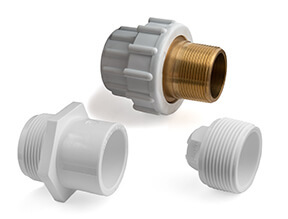 These are not compatible with standard pool pipe union fittings that we, or indeed anyone else, sell in the UK. 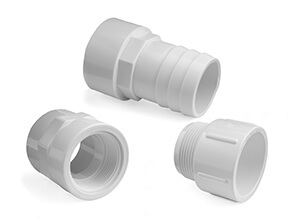 If you are purchasing second-hand pool or hot tub equipment without the original union fittings, it is important that after matching threads and giving you a plain socket or spigot, your first white PVC pool pipe fitting - on both the inlet and the outlet sides - is a standard plain PVC union. This enables the piece of pool or spa equipment to be taken out for servicing or replacement in the future, without having to cut and re-cement the pipe.